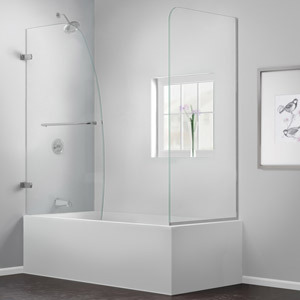 Top Quality Tub Doors in Manhattan, Queens, Brooklyn and surrounding Areas for your Homes, Kitchens and Baths. Home Art Tile presents a broad range of well designed Tub doors to meet your expectations while offering you good services. By a combination of a farfetched features and innovation ideas, we offer you reputable tub doors to improve the appearance of your space. You can choose from Aqua Lux with Return Panel, Infinity-Z, Aqua Ultra, Visions, Aqua Extra with Extenders, Duet, and Aqua Ultra with return panel, Mirage, Aqua Uno, and Enigma-X. 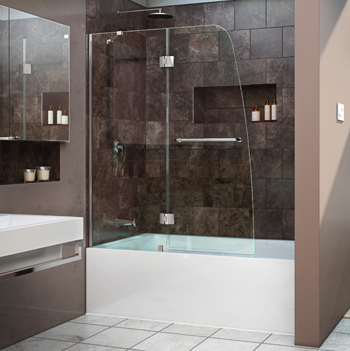 Infinity-Z comes with a brushed nickel hardware finish and a frameless glass design. It has anodized aluminum profiles and guide rails. Infinity-Z offers an Out-of-plumb installation adjustability of up to one inch per side. You can easily shorten the aluminum top and bottom guide rails by cutting up to four inches. The material used is aluminum and tempered glass that is reversible for right or left door opening installation. Aqua Ultra not only offers a convenient tower bar on the outside panel, but also reversible for right or left door opening installation. The material is 8 mm tempered glass and Aluminum that is ANSI certified. Featured is solid brass hinges and anodized aluminum u-shaped wall profile. Aqua Lux with Return Panel. 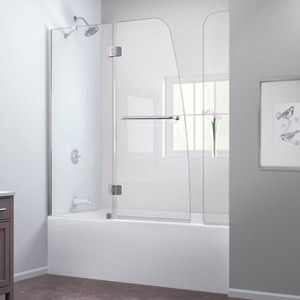 Aqua Lux with Return Panel works correctly with a convenient tower bars. The Lux comes with a clear frameless grass design and a self-closing brass hinges. 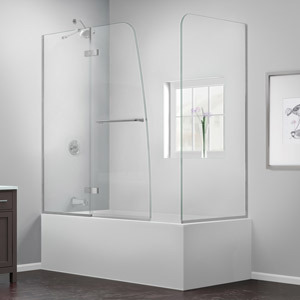 With a door waok0i9n of 23- 1/2 in, the tub includes finish home hardware and an 8 mm thick clear tempered glass. Also included is a wall mount breaks with and support arm for stationary panel. Aqua Lux with Return Panel Is Reversible for right or left door opening installation. 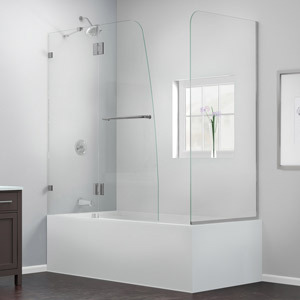 It is made from tempered glass aluminum materials and ANSI certified tempered glass. They feature a 6 mm clear tempered glass, a frameless glass design and an attractive Anodized aluminum wall profiles and guide rails. 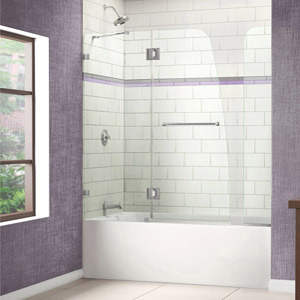 With a five-year manufacture warranty, the tub also features two sliding doors, flanked by two stationary panels. It offers an out of plumb installation adjustability of one inch per side. Offers U-channel for profiles for stationary glass support and a reversible for right or left door opening installation. 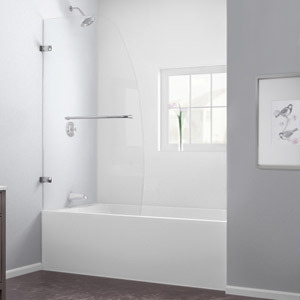 Aqua added with extenders is meant to be installed on a finished wall, Aqua extra with extenders includes a Chrome, or Brushed Nickel finishes hardware and a quarter-inch plumbing adjustment. It is made from aluminum and ANSI certified tempered glass. 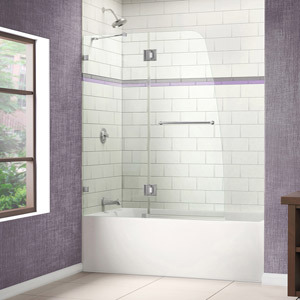 Comes with either a Chrome or Brushed Nickel hardware finish and Anodized aluminum profiles and guide rails. 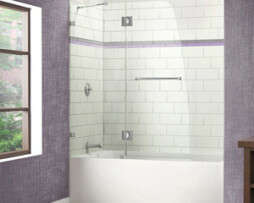 Duet features a shower bypass design and should be installed on a finished wall. Duet It is made from aluminum and ANSI certified tempered glass. 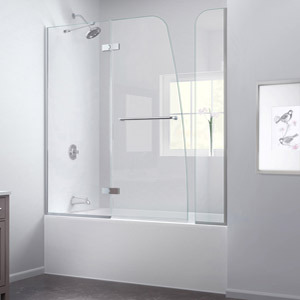 Mirage comes with excellent designs and functionalities that include a distinctive fully frameless sliding shower door design with a sliding panel that and two stationary panels. Reversible for right or left door opening installation, Mirage has Stationary glass panel with two glass shelves functionality. The material used is aluminum and tempered glass. 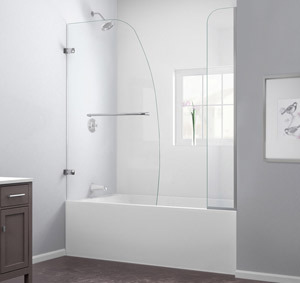 This is an exceptional tub door that offers you simple slide door functionality with large wheel assemblies on a Stainless Steel track. 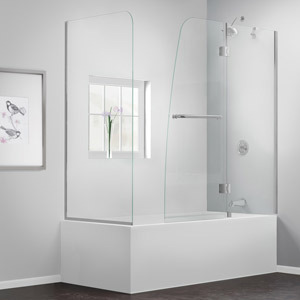 It features anti-splash threshold to prevent water spillage and a frameless glass design. Also featured is a polished Stainless Steel hardware finish. Enigma X is made from aluminum and tempered glass. Take a look at the product page to find out more supply’s for your needs.